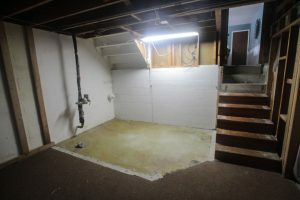 The first before photo depicts one of our primary challenges; design an efficient space for a wet bar while hiding the water meter, plumbing and the underside of a staircase that goes to the floor above this tri-level home. The center photo shows how we framed the walls of this area to eliminate the stairwell from view. The last photo reveals the final results. The tall cabinet at the left provides ample storage, as well as access to the plumbing meter. This area includes an ice maker, mini refrigerator and wine cooler. The remaining area of the room is set up as a home theater with three HDTV screens. 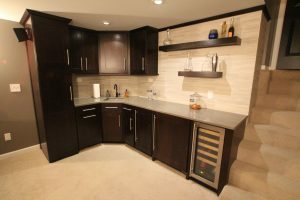 This third set of photos shows an initial rendering of the wet bar area created during the design process. Renderings played an instrumental role in the design process for this client. With minor design revisions we were able to make the changes you see in the completed remodel photo during the Design Phase. Our second challenge was to effectively sound proof the room. 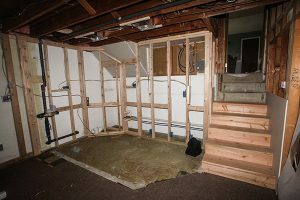 We successfully used several techniques to keep sound levels from entering and escaping this home theater room.